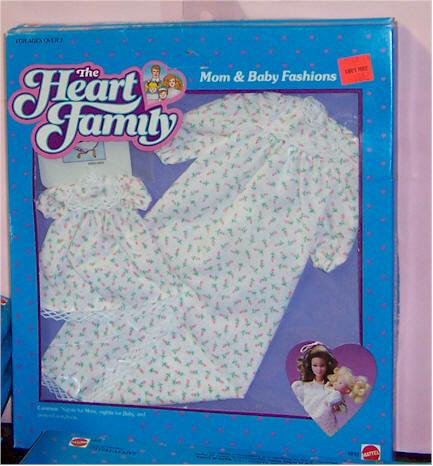 Go to bottom of the page and check out the OUTFITS in Original Box. 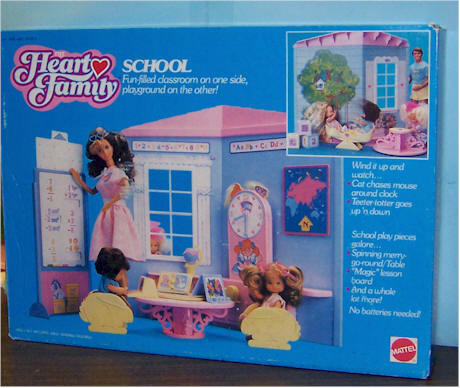 1988 School - Fun-filled classroom on one side, playground on the other. 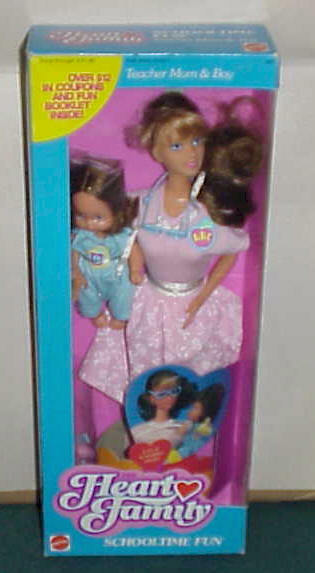 Mint in box - sealed on both ends. 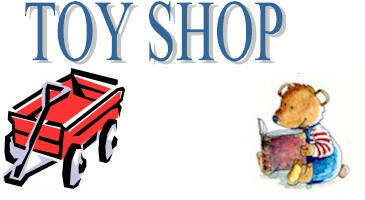 School play pieces include: Spinning merry-go-round/table, Magic lesson board, and a whole lot more. 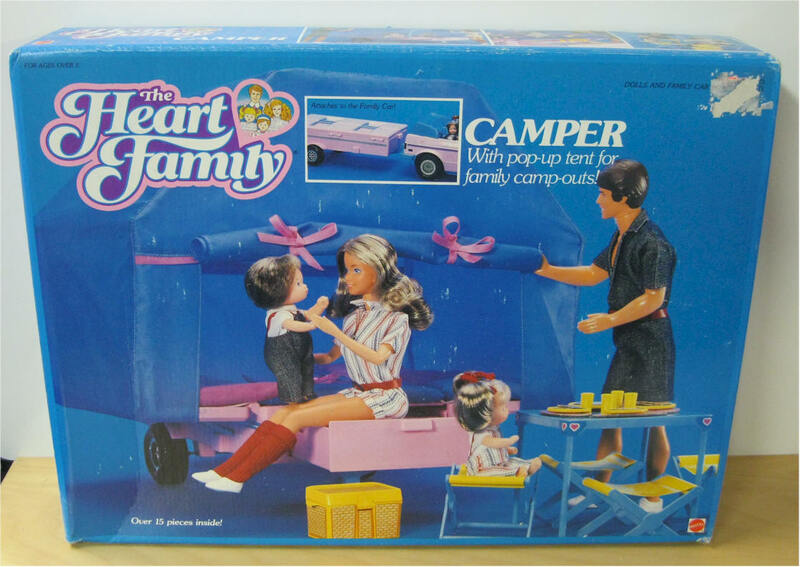 1987 Camper with Pop-Up Tent - 15 pieces. Includes: table 3 chairs, dishes. Mint in box. 1987 Camping Fun #3146. 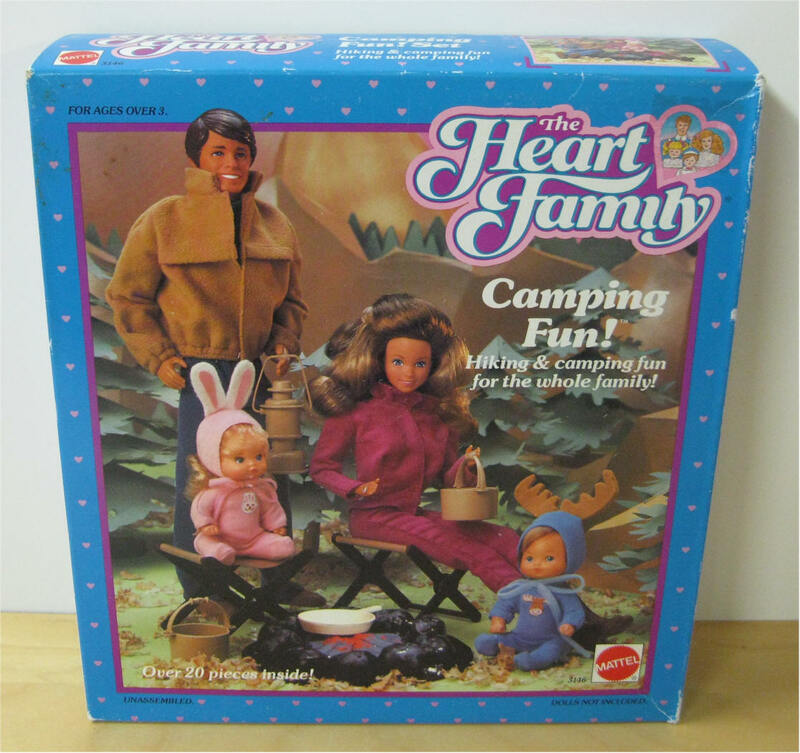 Camping fun contains a play campfire, two camping stools, a frying pan, two pots, a lantern, two helmets, along with a jacket, pants and boots for Mom, a jacket, jumpsuit, and shoes for Dad; a jumpsuit, shorts, and moose hood for son, and a jumpsuit, shorts, and bunny hood for daughter. 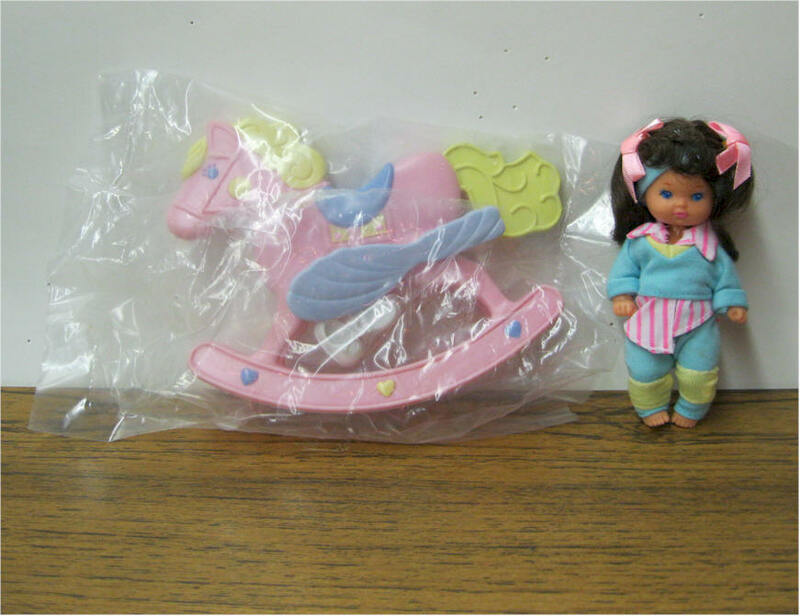 1988 Nellie & Rocking Horse #5399. Baby Cousins. 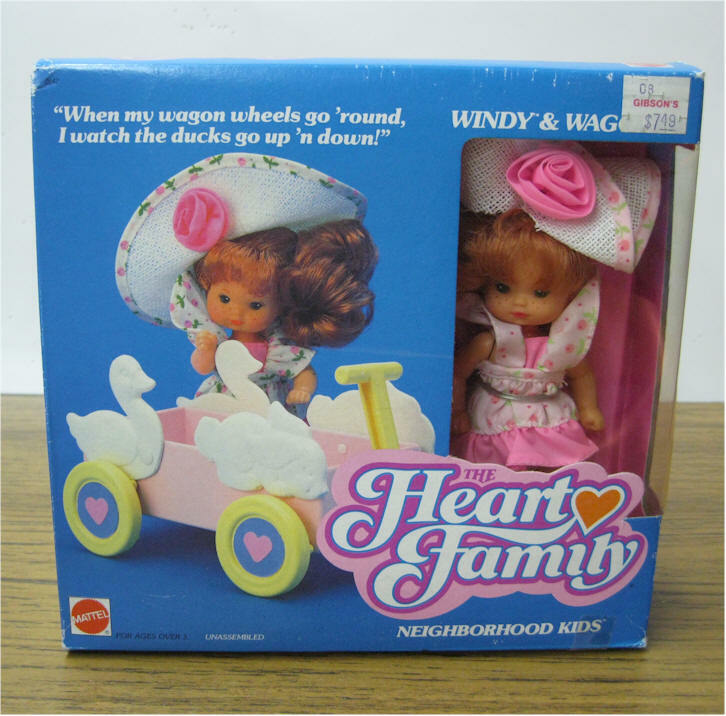 1988 Windy and Wagon #7142. 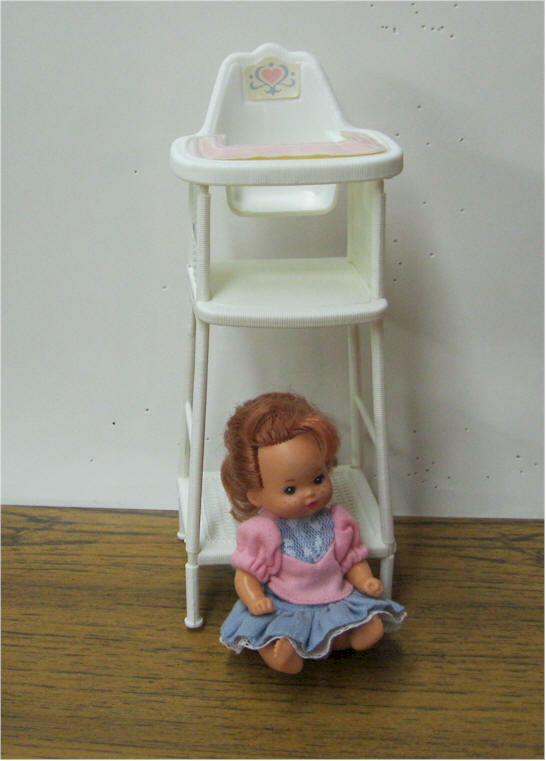 1987 The Heart Family #5397 Janet and Potty Chair. Box open on one end. Mint in package. 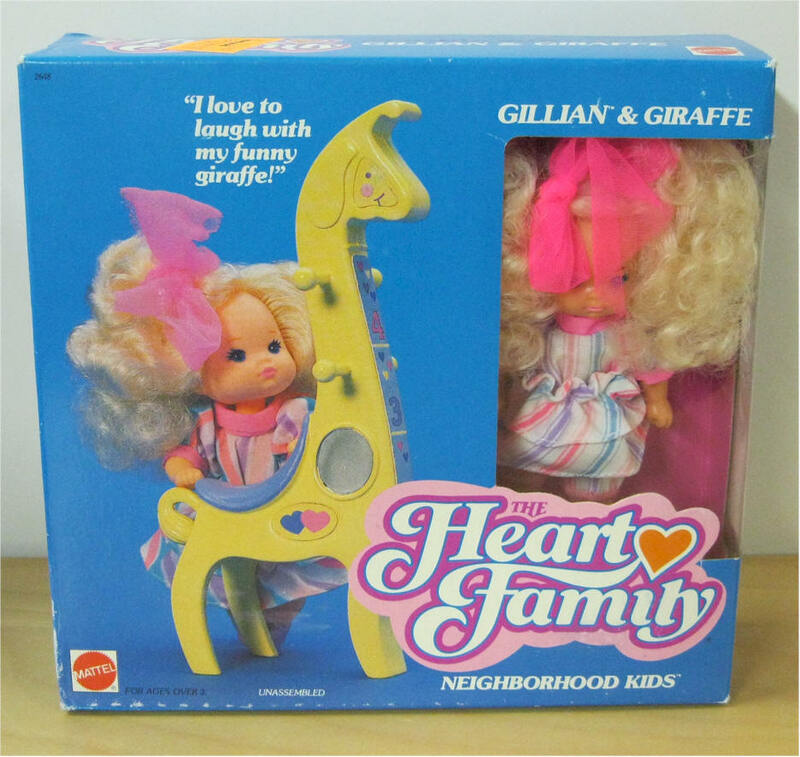 1988 The Heart Family Gillian and Giraffe. Box sealed on both ends. Mint condition. 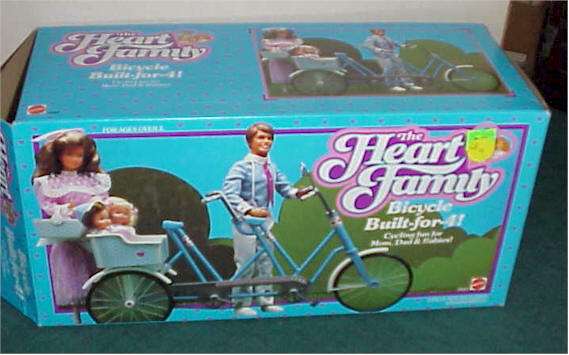 1988 The Heart Family Baby Keny & Tricycle #5394 Box has been taped on the top. Includes everything listed in box. Excellent condition. 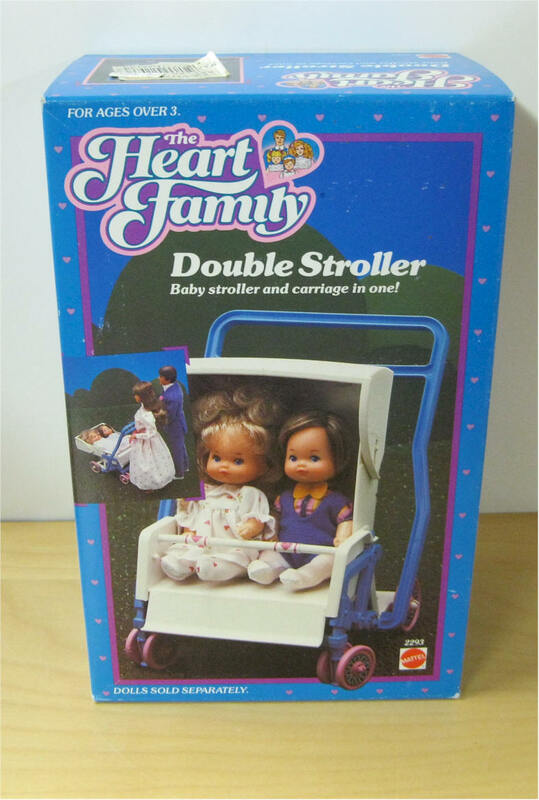 1985 The Heart Family Double Stroller #2293. Box sealed on both ends. 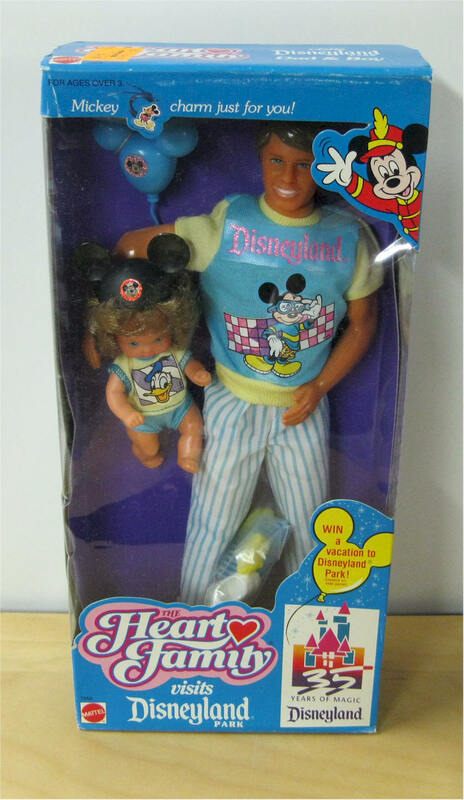 No dolls included. Mint Condition. 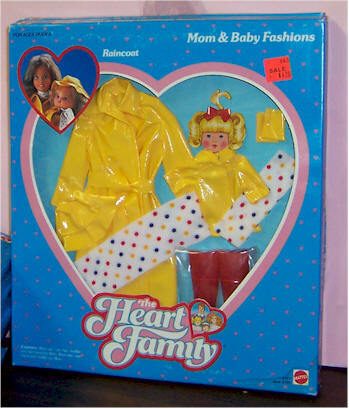 Two Heart Family Moms and 2 daughters. 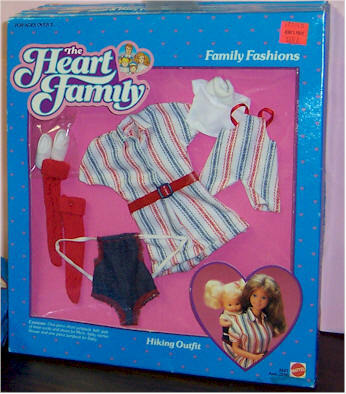 Original outfits - no shoes on Barbie. 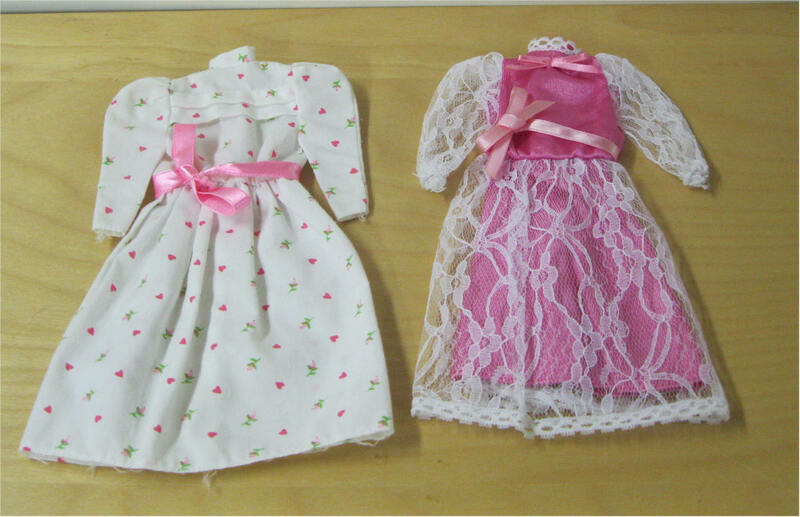 Pink dress with white bid collar - Valentine dress. Both in good condition. 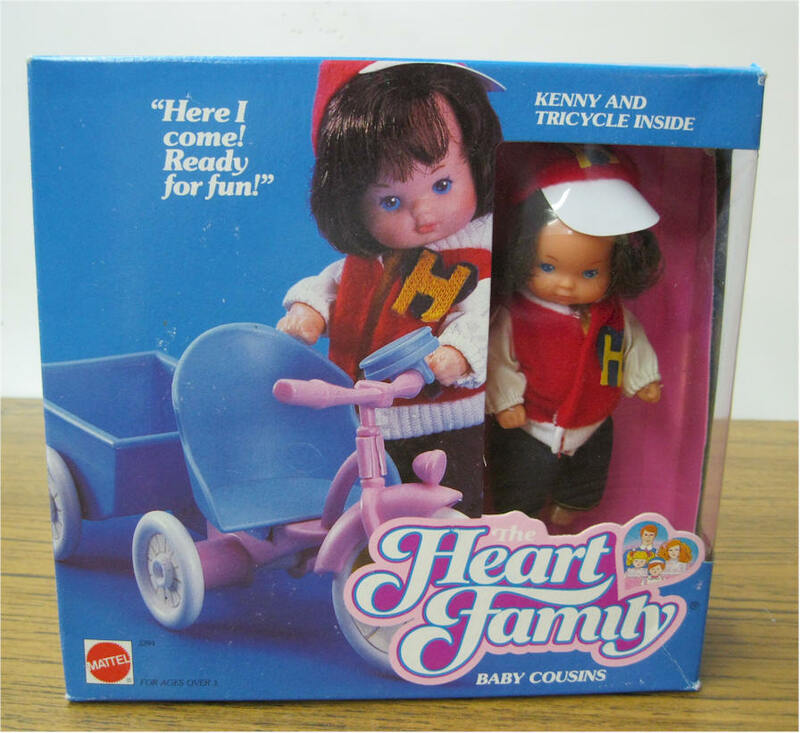 1988 The Heart Family Baby Keny & Tricycle #5394 Accessories in original package. Excellent condition. Nevery Played with. 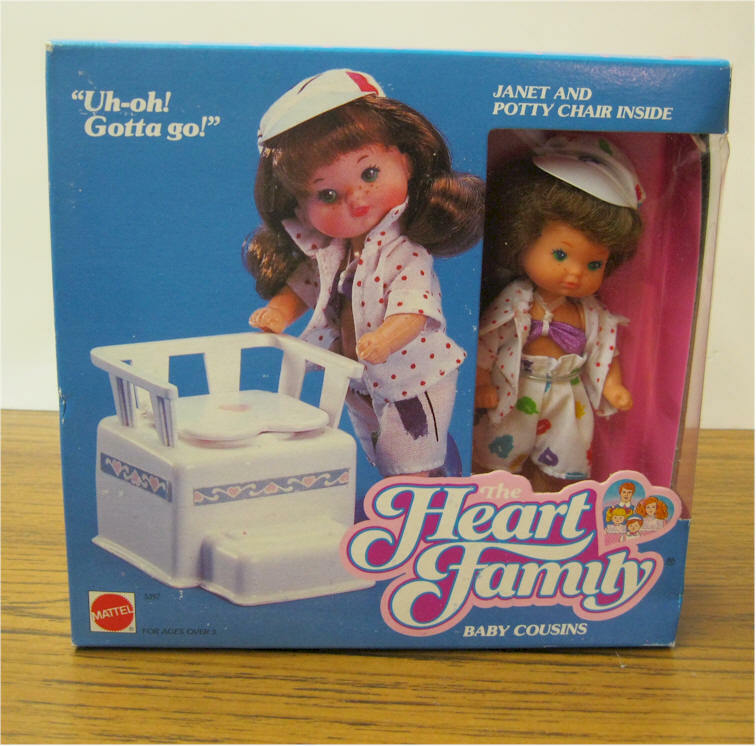 1987 The Heart Family #5397 Janet and Potty Chair. 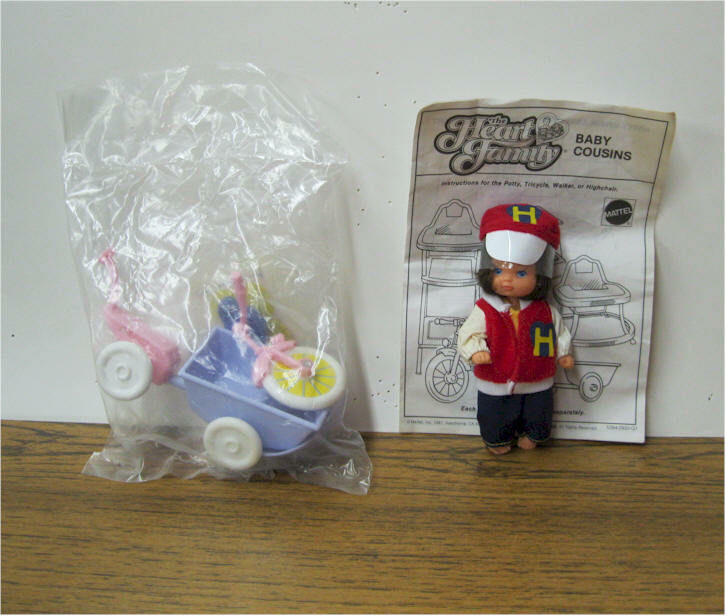 Accessories in original package. Excellent condition. Nevery Played with. 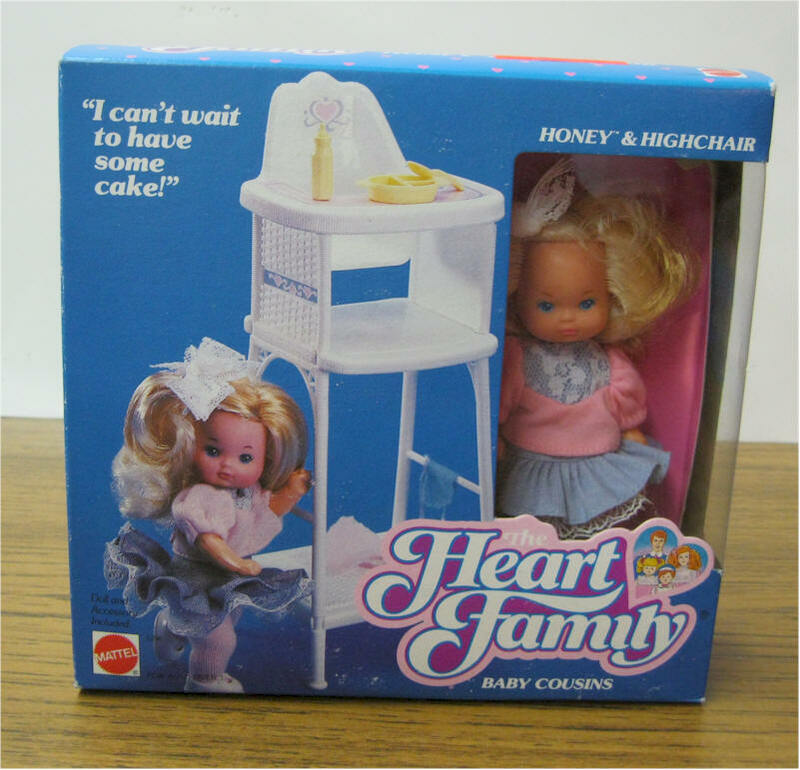 1988 The Heart Family Baby Honey & Highchair #5396 Accessories in original package. Excellent condition. Nevery Played with. 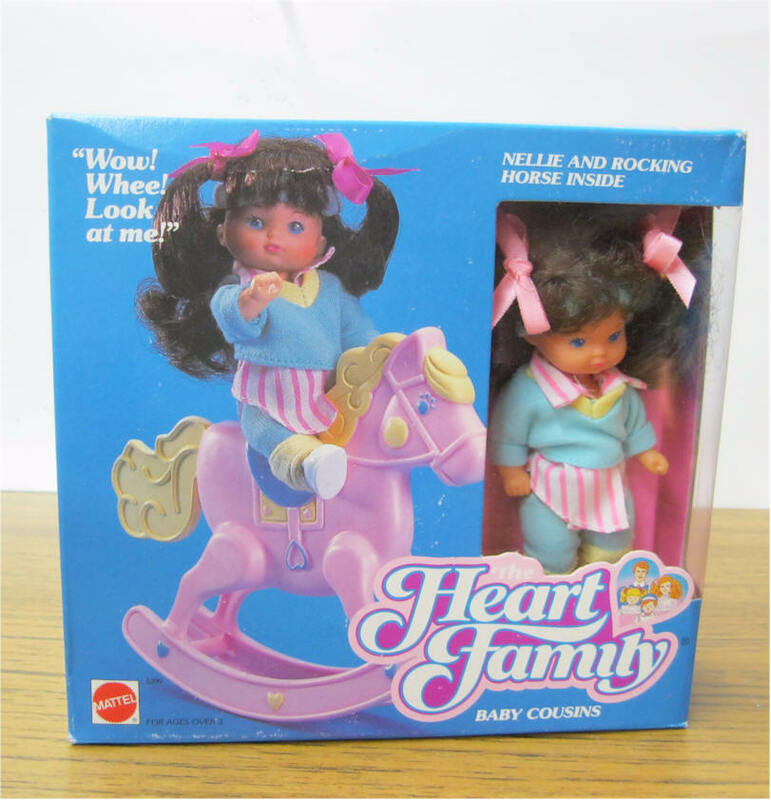 1988 Nellie & Rocking Horse #5399. Baby Cousins. 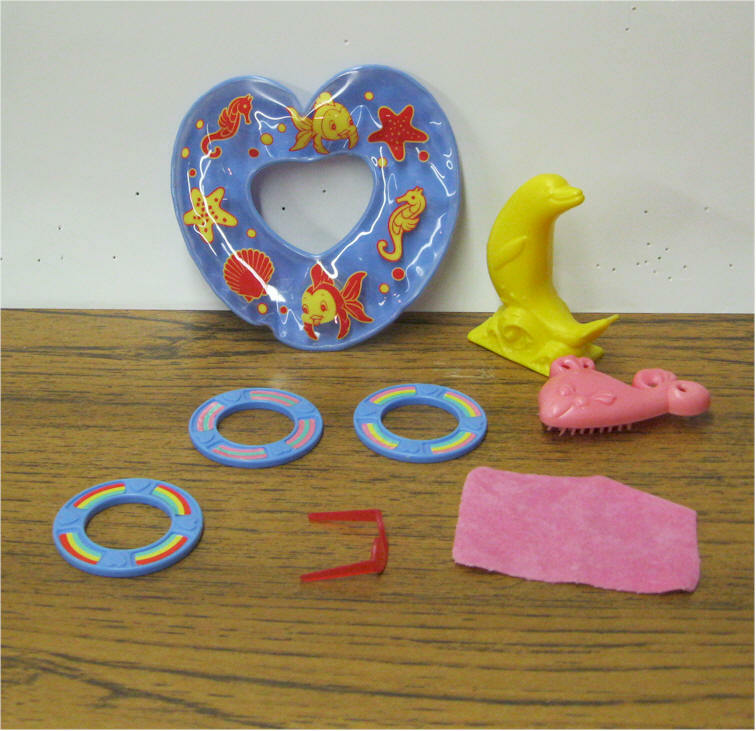 Accessories in original package. Excellent condition. Nevery Played with. 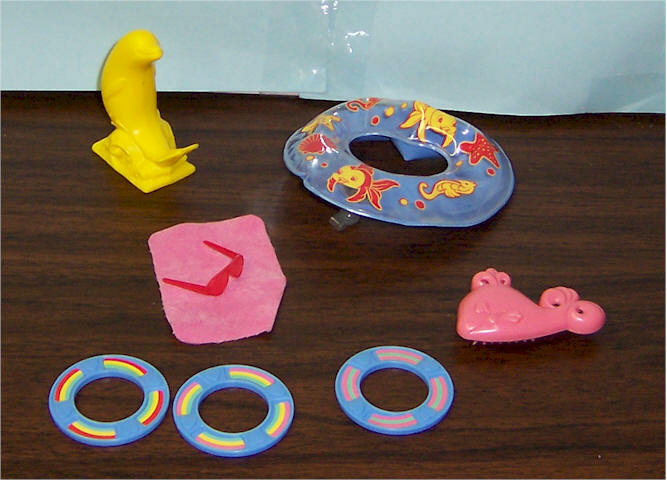 1986 Sunshine Fun Pals Water Set #2645 - pair of sunglasses, a water float, brush, towel, dolphin ring toss game with three rings. 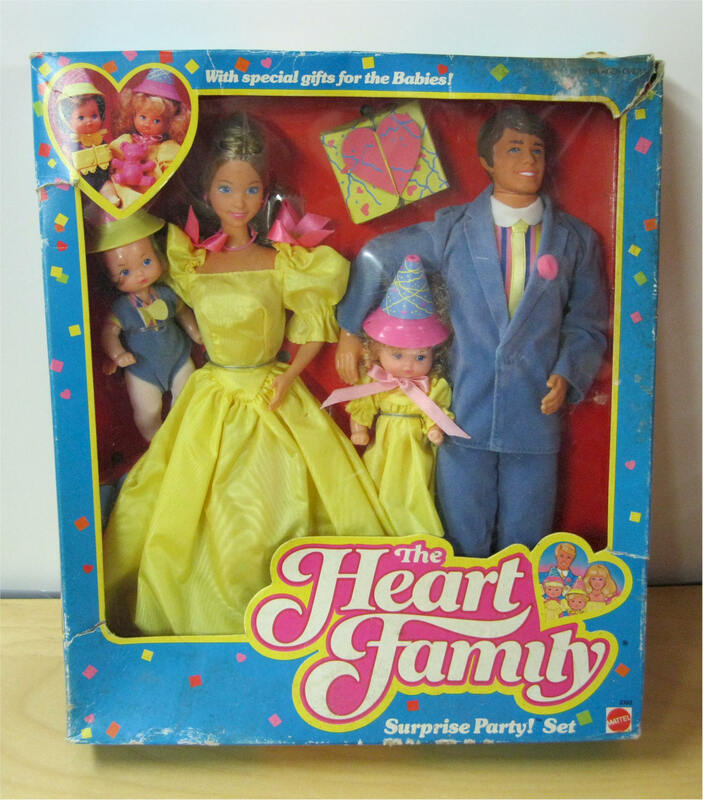 1986 Surprise Party Set #2383. Dad with Baby Girl Dad wears a lavender suit with striped pink shirt and yellow tie, holding his daughter wearing a yellow party dress. Mom and Baby. 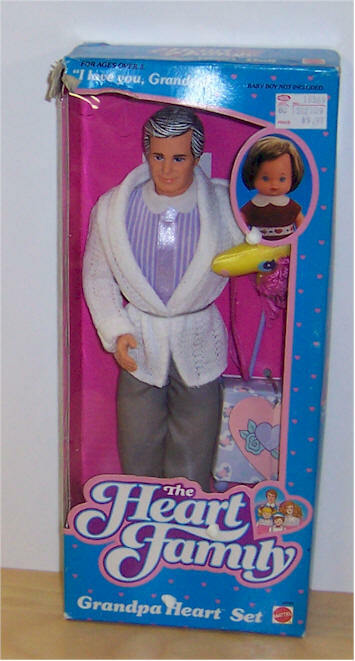 The pink package contains a toy bear for the girl. 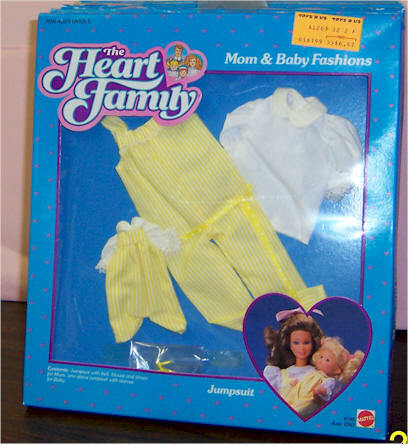 Mom wears a pretty yellow party dress. 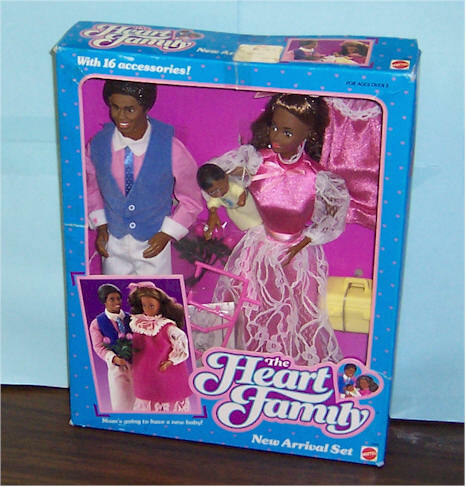 1986 New Arrival Set #2499.African-American Contains both Mom with new baby and Dad. 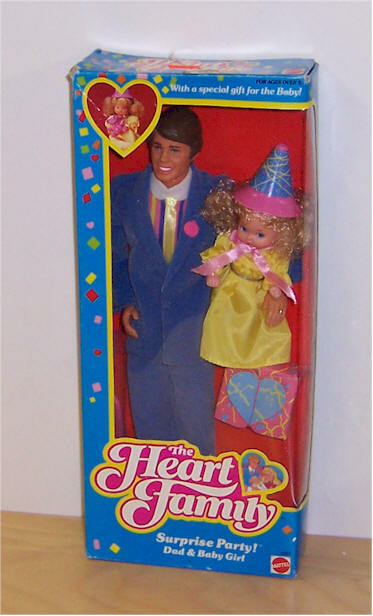 Dad wears white pants with a pink shirt, purple vest, and purple tie, gold band on the ring finger of his left hand. Includes hospital suitcase, camera, and flower bouquet. 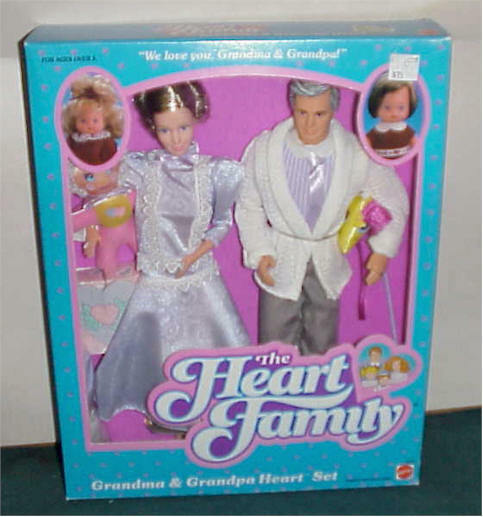 1987 Grandma & Grandpa Heart Set #3132. 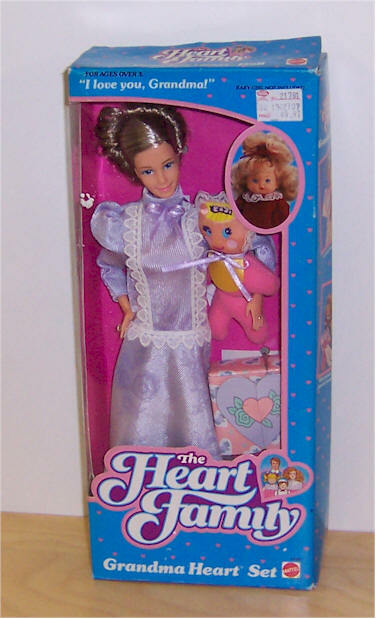 Moms has brown and white hair worn in a bun, and her dress is lavender with lace heart trim. 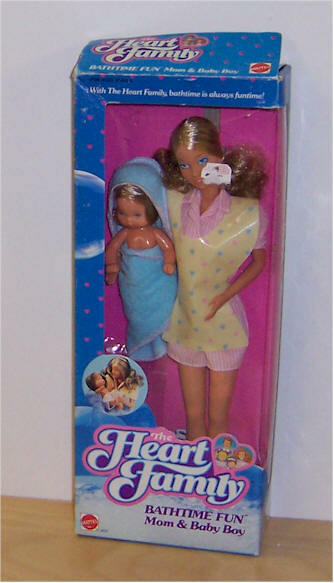 She carries a cloth rag doll and has a package containing pajamas. Dads hair is black and white, and he wears a white cardigan sweater over gray pants, and a lavender striped shirt with tie. 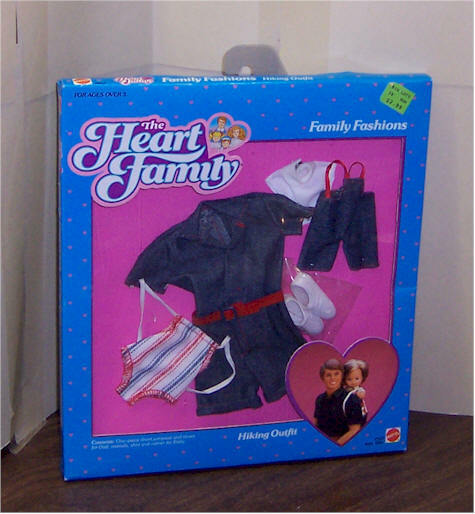 He carries a stick horse for his grandson, and the gift in his box contains overalls. 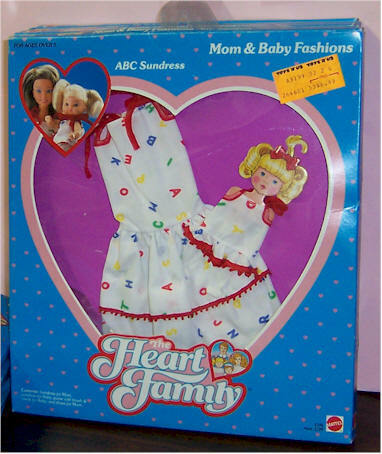 1987 Grandma Heart Set #4448. 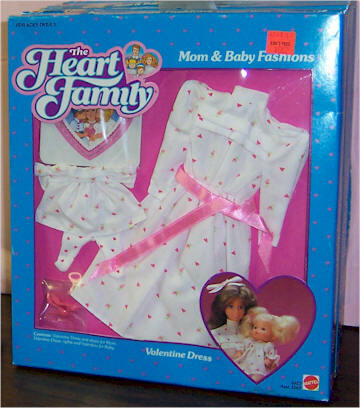 Moms has brown and white hair worn in a bun, and her dress is lavender with lace heart trim. 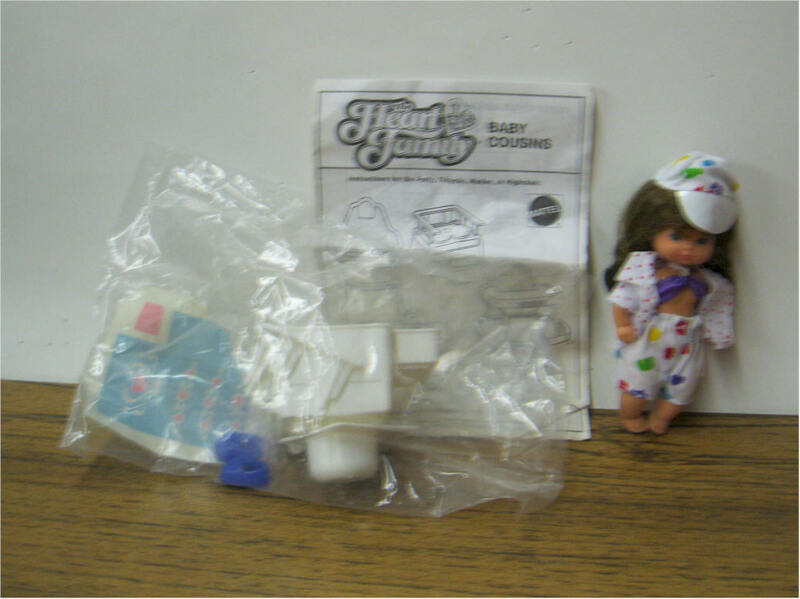 She carries a cloth rag doll and has a package containing pajamas. Top of box is taped closed. 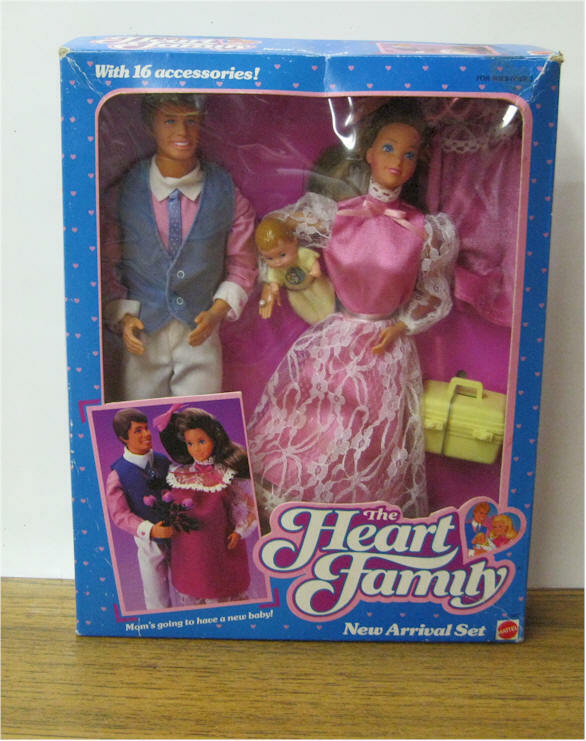 1987 Grandpa Heart Set #4449. Dads hair is black and white, and he wears a white cardigan sweater over gray pants, and a lavender striped shirt with tie. 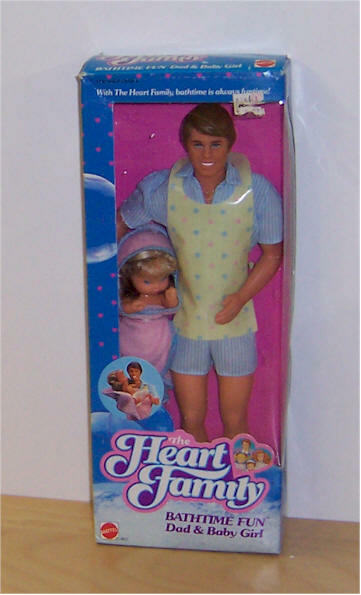 He carries a stick horse for his grandson, and the gift in his box contains overalls. Top of box has been sealed with tape. 1987 Kiss & Cuddle Set #1966. Dad wears a red jacket with navy blue pants, white shirt, and red tie. Daughter wears a red velvet dress with lace collar and tights. 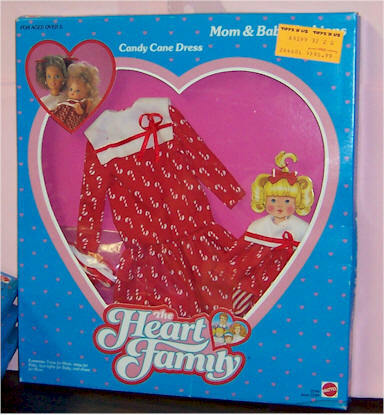 Mom wears a red dress with lace collar. Baby boy wears a red velvet outfit. 1985 Dad & Baby #9079. Father and son in matching outfits. 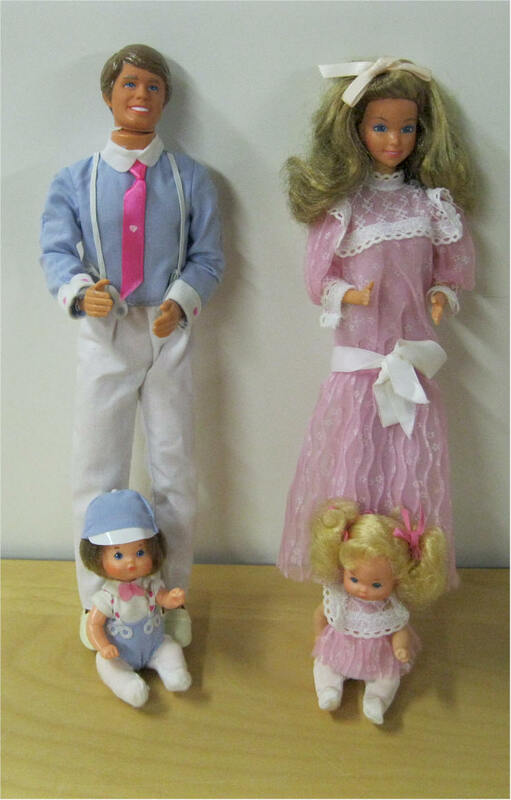 Dad wears a light blue shirt and white pants with suspenders and pink tie. 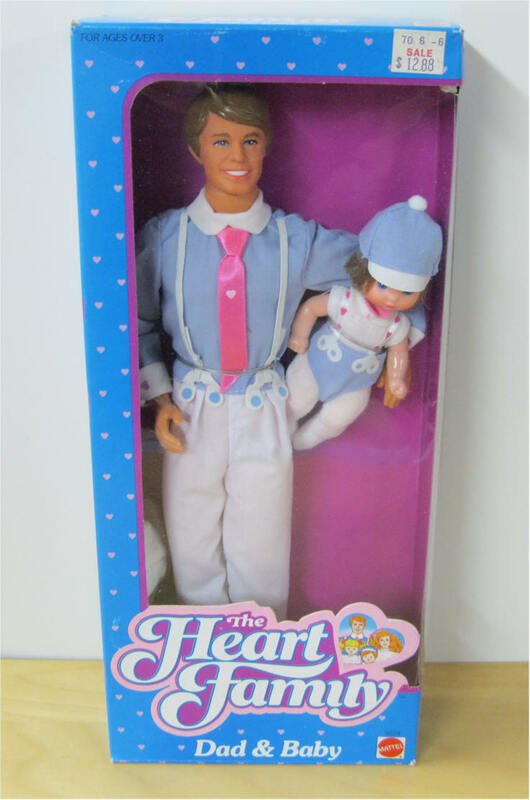 The baby boy wears a blue and white playsuit with suspenders, a pink bow tie, and a blue hat. The baby is scented with baby powder. Box sealed on both ends. 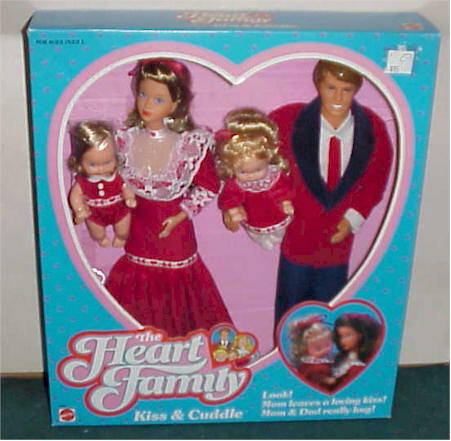 1987 Kiss & Cuddle Set #3140. 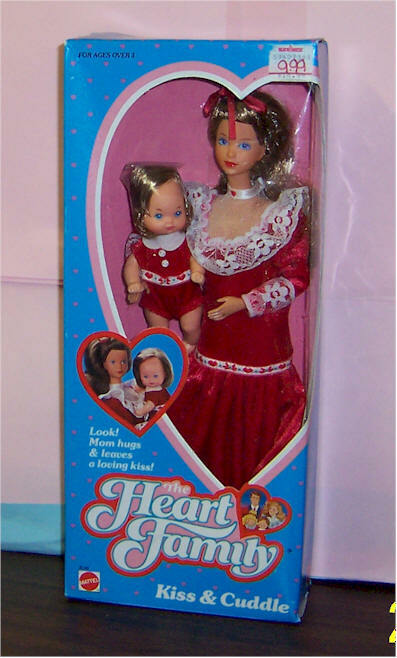 Mom wears a red dress with lace collar. Baby boy wears a red velvet outfit. 1987 Bathtime Fun - Mom and baby Boy #4165. Box sealed on both ends. Top of box has been sealed with tape. 1989 Schooltime Fun Teacher Mom & Boy #3281. 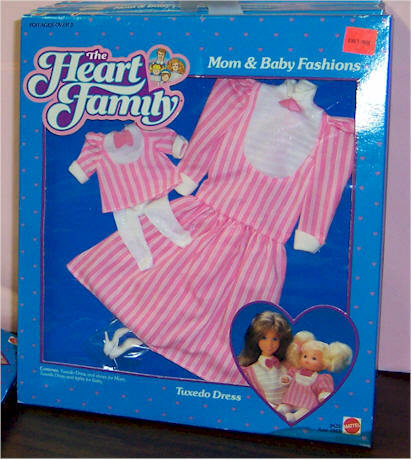 Features Mrs. Heart in a pink dress with blue heart-shaped glasses with her son, wearing a school uniform. A lunchbox, thermos, ruler, pencil, scissors, brush, and shoes are included. 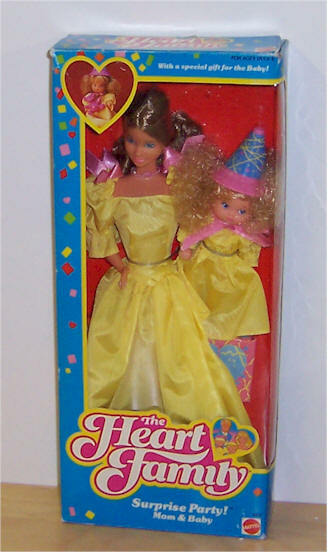 The Fun Book included with these dolls contains a dot to dot picture, a rhyming game, a maze, photos of the 1989 Heart Family line, and coupons. Father and son in matching outfits. 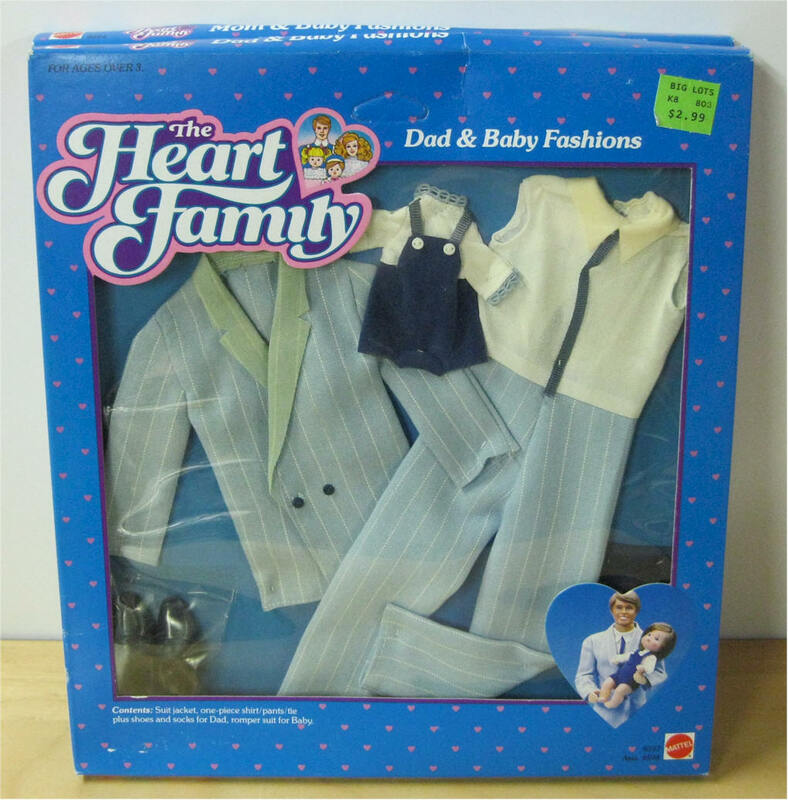 Dad wears a light blue shirt and white pants with suspenders and pink tie. 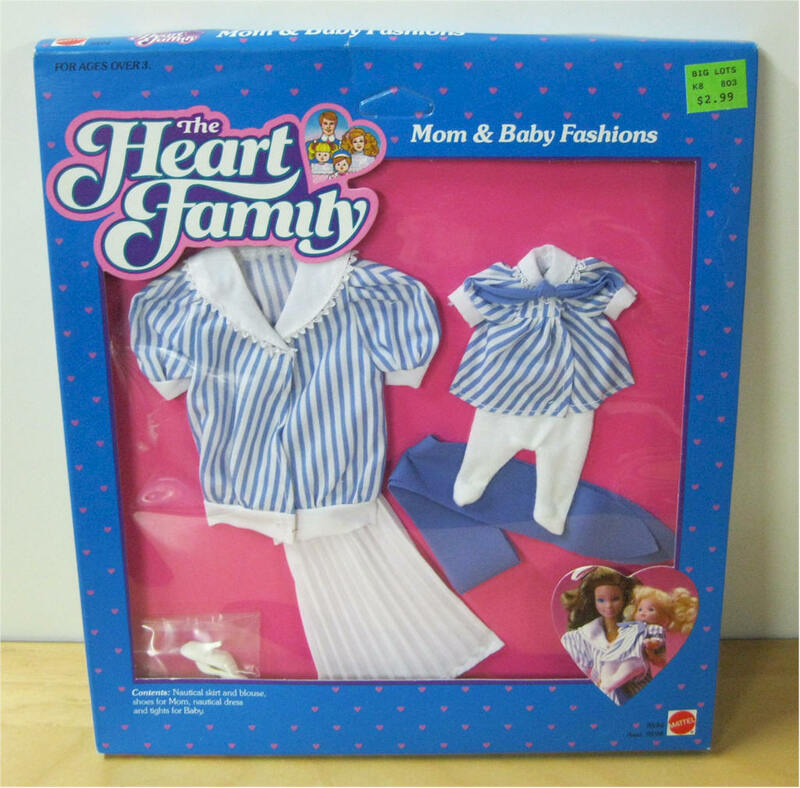 The baby boy wears a blue and white playsuit with suspenders, a pink bow tie, and a blue hat. 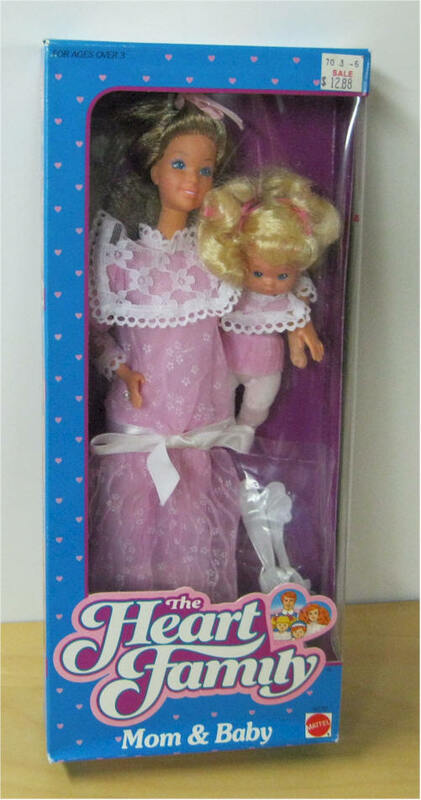 Mother and daughter together with matching outfit. 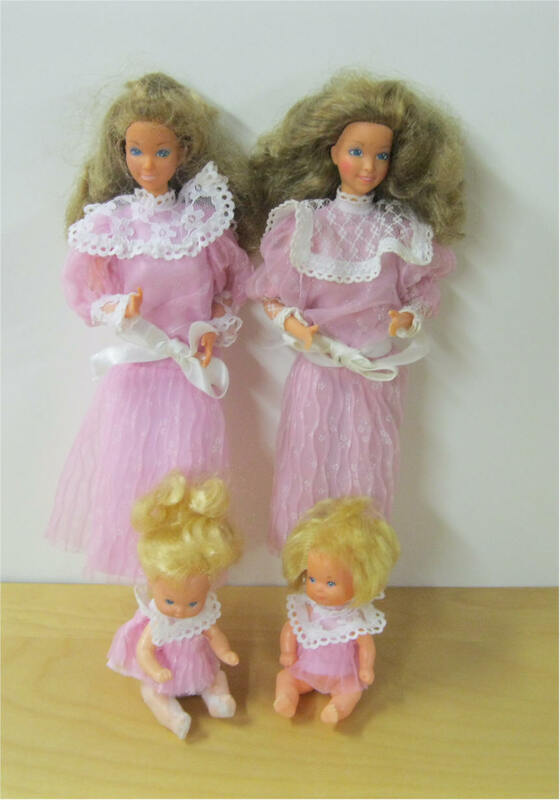 Soft pink dresses with tiny white flowers and white bib collars, edged with lace, and tights. 1986 Bicycle Built-For-4 #2685 is the family's tandem bike equipped with seats for Mom and Dad, as well as two passenger seats for the babies. 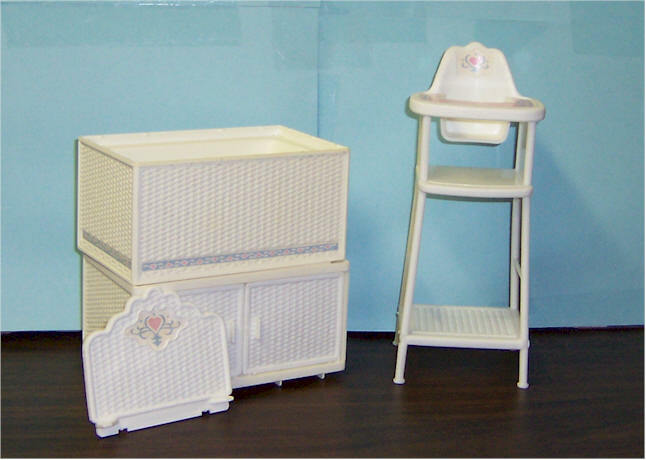 A picnic basket is included. 1990 Dumbo Ride #1076. 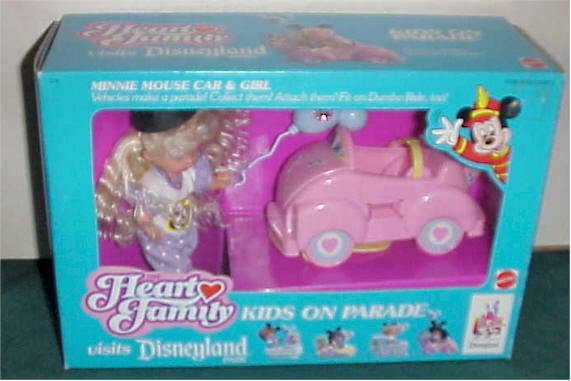 Is a wind-up ride that goes up and down while The Heart Family babies ride in the two Dumbo vehicles, which have wheels and are detachable for use in a parade. 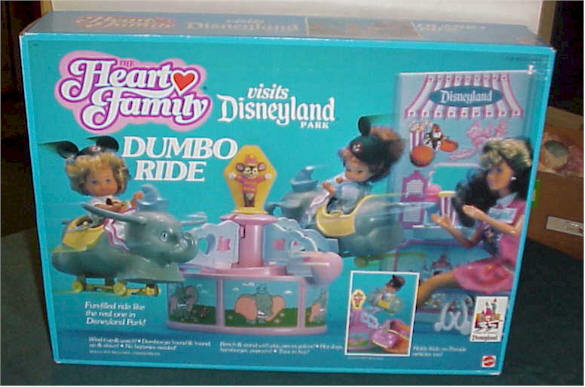 Up to four kids on Parade or Dumbo vehicles fit on the Dumbo Ride at once. 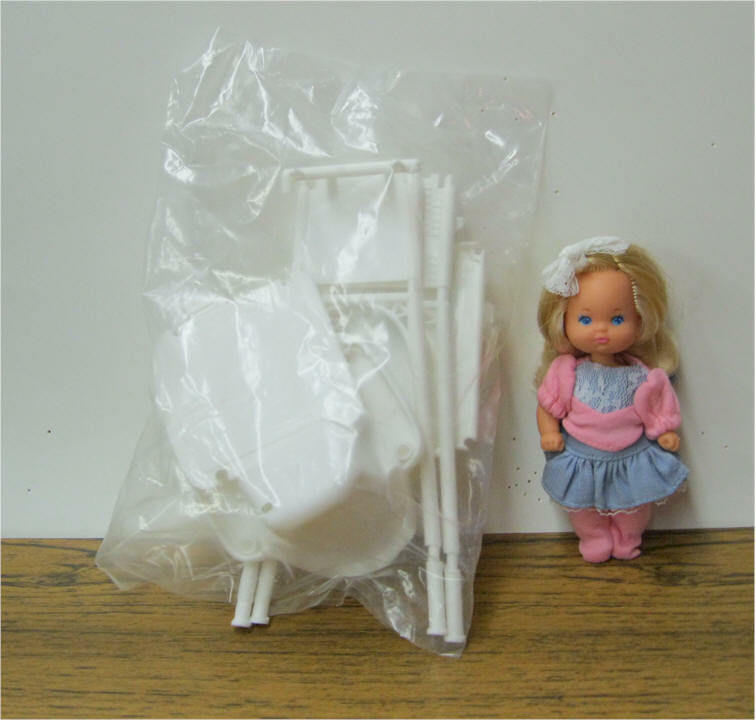 A bench and vendor stand with hot dogs, hamburger, and toys for sale are include. 1985 Family Car #9566 is a baby blue Volkswagen Cabriolet with medium blue interior. One pink and one blue carseat for the babies are included. The license place has a heart shape followed by the word FAMILY. The trunk opens for storage. 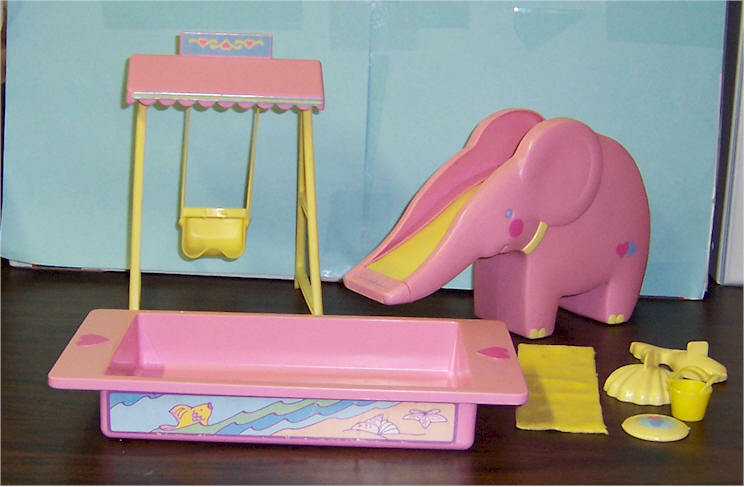 1986 Sunshine Fun Playset #2760 has a pool/sandbox, water-squirting elephant slide, swing, pail, shovel, seashell, whale, and towel. 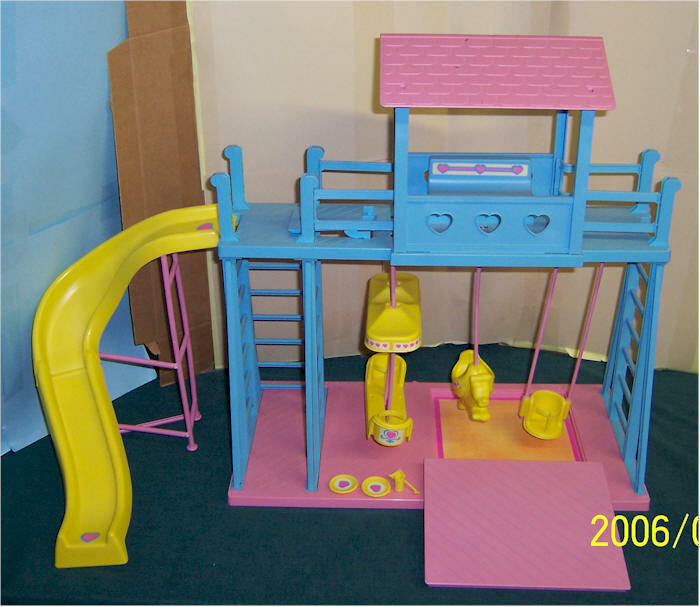 1986 Playground #2789 has two swings, a glider, a slide, a sandbox, four ladders, a trap door, a baby bench, two plates, cup and shovel. 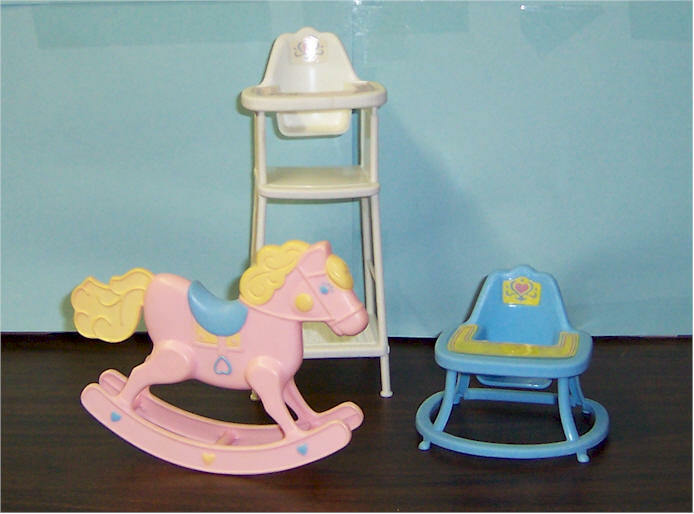 1986 Babies' Playset includes a rocking horse, walker and highchair.